(Newport, RI)- HOT off the press! 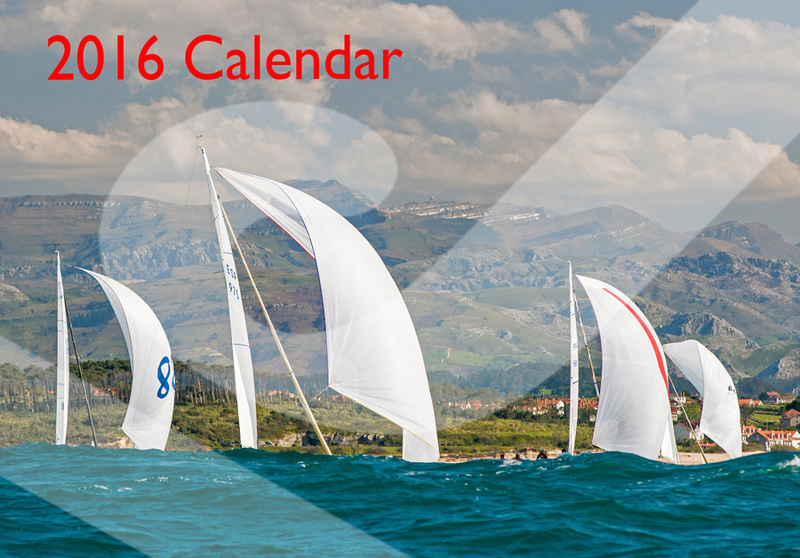 For 2016, we have created another beautiful calendar for J sailors who love the joys of sailing a J in some of the most spectacular harbors and waters of the world. Whether you are a cruising, racing or armchair sailor, these stunning sailboat photographs will transport you to wonderful sailing experiences in far away places. The 2016 sailing calendar features J/22s, J/24s, J/70s, J/80s, J/88, J/105s, J/111s and a J/42 sailing in many of the worlds most popular sailing areas- Cowes (the Solent), Newport (Narragansett Bay & Rhode Island Sound), San Francisco Bay, Puget Sound, Les Sables d’Olonne, Biscayne Bay, Lake Michigan, Kiel, Santander and Travemunde! A sailing calendar is a great gift for loved ones, family, friends and crew- see the photo gallery here. Order your 2016 J/Calendar here today! VSport would like to THANK all our J/Gear customers. With the HOLIDAY season upon us, now is a good time to provide that special crew or Captain with a gift they will appreciate. For a limited time only, please use the Gift Code Below to receive a 15% discount on all J/Gear orders placed now until Nov. 30, 2015! Visit the J/Gear Store here and apply this discount coupon code- JB20156que. Discount subject to the following exceptions- J/Boat print and J/Boat half-model. (The Hague, The Netherlands)- Like their colleagues in the local J/80 fleet in the Netherlands, the J/22s enjoyed one of their largest turnouts for the fall Cooling Down Regatta. Ten boats sailed this year’s regatta in good sailing conditions, with the fleet being treated to eight races over the weekend! The winning FRAPORITA team consisted of Jean-Michel Lautier, Giuseeppe d’Aquino, and Denis Neves. The margin of victory was enormous, posting seven 1sts in the eight race series for a total of 9 pts. While the FRAPORITA gang vaporized the race course, it was quite the battle for the balance of the top five. Just barely hanging onto second place after posting a string of three 4ths for the last three races was the crew on ELAINE (Ivo Jeukens, Ir. Schildkamp, and Danny Struijkenkamp). Taking the bronze on the podium was JAM SESSION sailed by the team of Erik Verboom, Murat Almat, and Chris Bern. Their 2-3-2 in the last three races enabled them to nearly grab the silver, finishing just 3 pts back from ELAINE. Sailing a consistent series all weekend long was the family team on JUT EN JUL (Dirk, Jan, Rosemarijn, Sanne and Liselotte Verdoorn), taking 4th place with just about a 4th average! Fifth place was one of the famous J/22 teams in The Netherlands- the BIG ROLL TU DELFT- BROACH BARENT (with crew of Joost van der Heiden, Madelief Doeleman, Matthjis Vo, and Daan Grundeman). Taking 6th place was the top German team JOU JOU 3 (Thomas Loesch, Rob Longridge, and Katya Lenskaya). 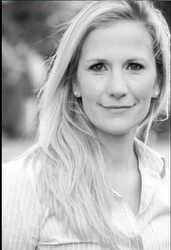 (Annapolis, MD)- Elena VandenBerg comes from a sailing family in Annapolis that has sailed J/105s for a long time. 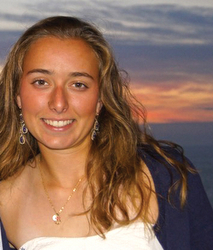 Elena is now a Stanford University sophomore and sailing team member, she learned to sail on the Severn River and Chesapeake Bay. When she first started sailing in Annapolis YC (AYC) Wednesday Night Races with her dad on a J/105, she says, “My mom asked me what I had done, and I said, ‘I pulled on the green string!’ I’ve learned a lot since then. Now, I trim the kite and occasionally critique my dad’s tactics!” Here is the Spinsheet.com interview of her about her college sailing career. What junior sailing programs did you participate in as a kid? “I started sailing at the Severn Sailing Association (SSA) when I was six and moved to the Green Fleet when I was nine. I moved to AYC when I decided to race in the Red, White, and Blue fleet. After my parents bought me a Winner Opti, I knew I was going to sail for the rest of my life. My friends and I all moved into Club 420s at the same time, and we looked forward to traveling to clinics and regattas. Our parents dropped us off at the airport, and we had to figure it out from there. We all learned so much from sailing in high level Club 420 and I420 clinics. Tell us a bit about your experiences sailing at Stanford. Do you have a favorite moment or regatta from your college sailing experience? What are the three pieces of sailing gear you can’t live without? What advice do you have for competitive high school sailors? (Freemantle, Australia)- The 2015 Fremantle Sailing Club's Rockwater Coventry Reef Offshore Race (48nm) had a bit of everything, 34 yachts competing in 4 Divisions started the race at around 9.30 in very warm, light and ever changing conditions. By mid-day it was approaching 38 degrees, and the finish saw many boats racing against a spectacular lightning storm with rain. Division 2 (IRC 1 to 1.10) had the largest fleet of 13 yachts all dueling at the start line in a 6-knot breeze. It was Giddy Up (Farr 395), JOSS (J122) and Aquila (Northshore 369) who got away best, closely followed by Circa (C&C 115) Wasabi (Elan 410) Prime Factor (Farr 40), Argo (Archaumbault 40) and Cro-Connection (C&C 115). Giddy Up was fastest to the 1st mark, with the majority of yachts launching their A2’s for the 6 nm 2nd leg to the Windward Channel Marker off the south of Rottnest Island. This was by far the toughest and most frustrating leg as the first hints of seaweed appeared and the winds lightened and started to swing from the northeast to the north. It didn’t help being in Gauge Roads with large ships powering through the fleet and Rottnest Island power boat enthusiasts heading to the island. When the fleet finally rounded the Windward Channel Marker, Giddy Up continued to lead and Wasabi had edged ahead of JOSS. The winds shifted from northwesterly to southwesterly, and throughout the 18 nm leg down to Coventry Reef the winds slowly built to 8-10 knots. JOSS, using our No 1 Light jib, did the best, catching Wasabi and closing on Giddy Up. The highlight was a 6 tack duel between JOSS & Wasabi near Coventry Reef that saw JOSS come out ahead, & round the windward Coventry Reef mark 100 m ahead of Wasabi and in clear view of the Giddy Up crew. With JOSS’ big light green A2 flying it was a straight run back to the channel North of Garden Island, JOSS & Giddy Up were well matched in terms of speed however it appeared clear that Giddy Ups lead did not appear nearly enough from an IRC rating perspective. Wasabi was falling back so tacked in closer to Garden Island. Due to the challenging light conditions & the impending lightning storm, race control shortened the race to the Garden Island Channel (40nm), with a downwind finish. JOSS crossed the line 2nd on the water in Div 2, at 5.45pm only 5 minutes behind Giddy Up in a time of 7 hours 54 minutes winning both Div 2 IRC and 1st in Div 2 YAH. VEGA RAGAZZA Girls are Fast Sailors! (Hamburg, Germany)- Stephanie "Steffi" Köpke (30 yrs old) first started sailing on the Elbe River in Optimists. Then, eight years ago she became the skipper of the J/24 VEGA RAGAZZA and the women’s team from Mühlenberger Sailing Club (MSC). Meanwhile, she is working today at Audi AG in Ingolstadt, Germany in marketing/communications. 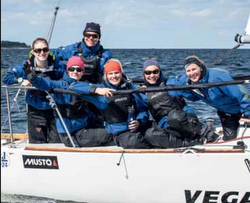 When did you start sailing together as a women's team? How did you choose the name "Vega Ragazza"? “VEGA is the name of a Hamburg shipping company that has sponsored us. When we sailed for the first time in Italy, we heard some Italian J/24 teams shout out, ‘ciao ragazzi’. We learned later they meant “hi fun girls”! So, we changed it to rhyme with Vega, that is how it became Vega Ragazza. Why were there so many women-only teams in the J/24 Worlds at the start? “The J/24 is a simple boat to sail, well understood, and with a women’s crew we can be competitive even in very windy conditions! We always have five people sitting on the rail. With a crew weight of 400 kg, we have a higher percentage of our weight on the rail! In addition, there are many women’s teams that have seen us (and other women’s crews) as examples to follow that have been successful at the pinnacle of sailing sport in Germany and J/24s worldwide. What distinguishes the J/24 from other boats to sail in Europe? “The J/24 is easy to sail, the deck layout is clearly understandable and simple and it makes the jump much easier for teenagers that have been sailing a two-man dinghy! A bigger boat needs more crew and considerably more strength from the crew. 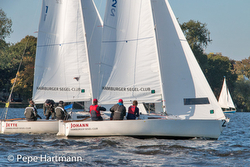 In addition, Hamburg has a large, active scene in the J/24 class that has constant competition with the other clubs, especially BSC and SVAO. Lots of fun! A real plus is the affordable price point of a used J/24; it is a nice inexpensive “keelboat for kids”! 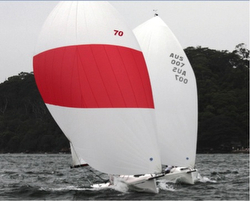 Is the J/70 a competition for the J/24? What distinguishes the J/24 class? How does your 2016 season look like? As a result you have to celebrate properly the end of your tenure in J/24s! First winner of the German Open and then the best women's team in the World Cup! Will the Mühlenberger SC build a new women's team? Unfortunately, not in J/24s. Instead, the club wants to sell the J/24 and invest in a new J/70, so that the club has the proper training boat for the Deutsche Segel-bundesliga. As a result, I hope to have my first experience sailing in J/70s! I look forward to sailing more regattas in the future! (Sydney, Australia)- There was near perfect conditions for the 54nm offshore round trip- the Sydney to Botany Bay race, held by the Cruising Yacht Club of Australia. The fleet split almost in two off the start, some choosing the eastern side, the rest going west, which they seemed to benefit from. It was a quick downhill ride to Botany Bay, with the fleet under spinnaker, but the return journey was not as comfortable, with fleet beating into the increasing breeze. Adrian van Bellen’s J/122 JACKPOT continued her great performances of last season, winning the race quite handily in ORCi. 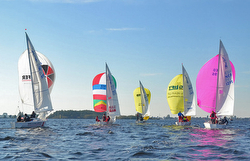 (Hamburg, Germany)- This past weekend was the 27th time the Alster Match Race was hosted by the Hamburg Sailing Club. Twelve teams from six nations participated sailing J/22s on the gorgeous Alster Lake all weekend long. With perfect weather and good wind, the sailors had a total of 66 matches over the two days. The winner was unbeaten. With eleven victories, Felix Oehme’s team from the Norddeutscher RegattaVerein won the match race quite easily. Taking second overall was Max Gurgel from Hamburger SC and in third was Christian Tang. (Heathrow, United Kingdom)- On the 31st October and 1st November RTYC and the RYA launched the first ever club keelboat fleet racing league in the UK at Queen Mary Sailing Club. Seven teams participated in the trial event. The UK Sailing League is a new keelboat model that has been successfully run in Germany over a number of years. 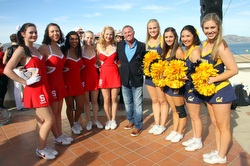 RTYC bought into the concept and collaborated with the RYA to help launch the new enterprise. Sailing clubs from all around the UK competed at the trial event; the format will now be rolled out across the UK. Participating teams included Port Edgar YC, Royal Corinthian YC, Queen Mary SC, Royal Southern YC, Royal Western YC, Poole YC, Royal Thames YC. The event uses a round-robin schedule with teams racing each other a number of times before the team with the lowest number of points is crowned the winner. Six boats competed in each 15-minute race with teams rotating boats throughout the event. 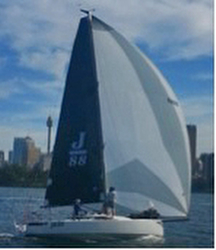 (Sydney, Australia)- The Sydney Harbour J/70 fleet has been racing since September thanks to the support of the Royal Sydney Yacht Squadron. The Squadron’s mini-regatta series follows a two-lap windward-leeward format with 3 races each day. 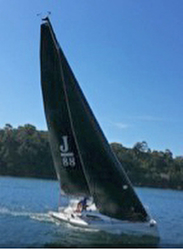 The fleet is sailing every three weeks for the Squadron’s mini-regatta series, the greater Sydney area has about 10 J/70s. It has definitely been a thrill sailing on the magnificent Sydney Harbour regularly in one of the most exciting one-design classes around. The 3 weeks so far have been sailed in light and generally shifty spring conditions, with the last race completed on Saturday being a drifter. All crews are looking forward to the arrival of the traditional summer northeasterly breezes that tend to hit hard as the weather warms up. After the completion of the first three regattas, the most experienced crew on the harbour, JAMES skippered by Tim Ryan, has taken 8 bullets out of nine races, but not without being pushed hard by the other boats in each race. Stephen Brady in YKNOT scored a win in the 9th race after some brilliant light air sailing. YKNOT led for much of the first leg before being becalmed, then recovered to sail around the fleet and score a comfortable win. Paul Wood, racing his brand new boat JAVA for only the second time, led around the top mark only to be becalmed and unfortunately finished at the back. Murray, guest-skippering JUNO for Reg Lord, outsailed JAMES downwind on the last spinnaker run to record a second. The Series results after nine races have JAMES leading followed by JUNO, YKNOT and JAVA. J/36 PALADIN Takes NonSpin with High School Team! (Christiansted, St Croix, US Virgin Islands)- This past weekend, from November 13th to 15th, the St Croix YC in Christiansted, St Croix unfurled the regatta flags and signaled the start of the Caribbean winter racing season. The 23rd edition of the regatta included Optimists, with a VISA (Virgin Island Sailing Association) sponsored Optimist clinic on Friday and racing on Saturday and Sunday. The Big Boat race on Friday was renamed “Captain Nicks Race” in honor of our founder- Nick Castruccio, who turned 90 this year! The race for the rum was Saturday and Sunday’s overall winner. The runaway winner in CSA Spinnaker Class for the Captain Nicks Race Regatta was the J/105 DARK STAR from San Juan, Puerto Rico, skippered by Jonathan Lipuscek from Club Nautico Puerto Rico; they posted the unbeatable scoreline of 1-1-1 for three pts. 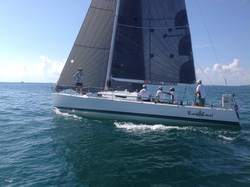 Finishing third was Douglas DeReu’s J/24 CRUZAN CONFUSSION, a local boat from Christiansted sailing to a 4-2-3 for 9 pts. And, in 4th place was another J/24, Dave Tomlison’s EL SHADDAI II with a crew from New Hampshire with a 3-4-4 record for 11 pts. 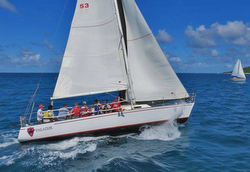 The CSA Non-spinnaker Division saw Stanford Joines beautifully refinished J/36 PALADIN participating with a crew of kids from the local St Croix High School in Christiansted. They perfectly mirrored the record of their friends on the J/105 DARK STAR, also posting three bullets to walk off with class honors. For the weekend regatta, a similar scenario nearly played out for both divisions. Again, Lipuscek’s J/105 DARK STAR crew rattled off six bullets in CSA Spinnaker Racing Class to finish with 6 pts, winning their weight in Cruzan Rum as the overall regatta winner! The J/24s finished 3rd (DeReu’s CRUZAN CONFUSSION) and 6th (Tomlinson’s EL SHADDAI II). Meanwhile, Stanford’s crew on the J/36 PALADIN repeated their solid performance and won CSA Non-spinnaker to win with four 1sts and two 2nds. According to Stanford, “the youth crew on the J/24 CRUZAN CONFUSSION with Doug Dereau and skipper Ethan Hanley, were awesome. The boat that won overall was the J/105 DARK STAR, Jonathan dry sails the boat out of Fajardo with a Teflon bottom, and had several veteran PR sailors on board who have been my friends, and competitors, for years. 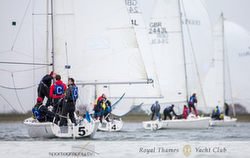 (London, England)- The Royal Thames Yacht Club ran the Belvidere Cup on Saturday 14th November at Queen Mary Sailing Club at Ashford Middlesex- it is a match racing regatta sailed in J/80s provided by the RTYC. There were four teams participating- Old Abingdonians, Old Radleians, Old Wellingtonians and a Royal Thames Academy team consisting of three girls and a token fella. The regatta consisted of two round robins followed by a final and petit final. At the end of the round robin stage the RTYC Academy had 6 wins, Abingdon 3, Radley 2 and Wellington 1. The final was fought out between Abingdon and the RTYC Academy. The Academy had so far been unbeaten and were odds on favorites to win. However, Abingdon won the first match by a whisker, the second match was won easily by the Academy. Everything rested on the last match's result. The Academy was leading passed the last rounding of the windward mark, but Abingdon's crew had a more than 50% weight advantage over the girls who were disadvantaged by the strong gusts. In the end, Abingdon passed the Academy boat, winning by a few seconds and taking the match and the trophy. The “Big Sail” = A Big Blast! (San Francisco, CA)- It came down to the last race. 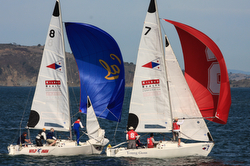 Stanford and Cal were tied 1-1 in a best of three competition sailing the St Francis YC matched J/22s. As both teams prepared to start just yards off the front of the StFYC’s race committee deck, the spectators went wild. The marching bands roared, the cheerleaders flew around and the live commentary rang out. No, this was not a football game; it was “The Big Sail,” an intercollegiate regatta between Stanford and UC Berkeley, (“Cal”) on San Francisco Bay. If you are looking for a new kind of regatta that will inject pure fun back into the sport of sailing, take notes. 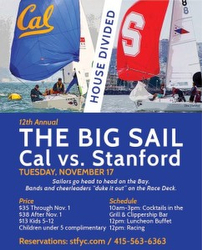 Now in its 12th year, The Big Sail takes place each November on the Tuesday before “The Big Game”, Cal and Stanford’s 123-year-old college football rivalry. 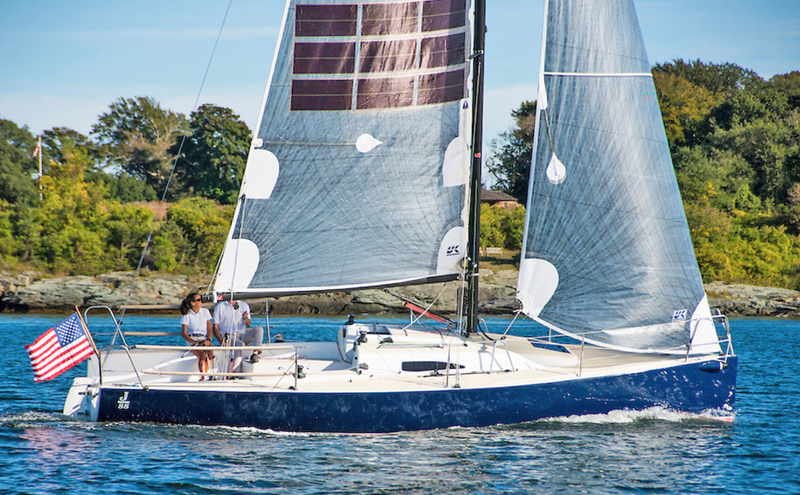 The Big Sail features four divisions: Varsity, Young Alum, Masters, and Grandmasters, and is raced in a fleet of one-design J/22s provided by St. Francis Yacht Club. Each division match-races on short 300-yard courses for the best two out of three races. Should each school win two of the four divisions, Varsity is the tiebreaker. This year, Stanford won the Varsity Division and Cal won Young Alum and Masters. Each school won one race of Grandmasters, which meant the third race would determine it all. Cal won the start, but Stanford had a good first upwind leg. They opted for the northern side of the course, which was favored, and gained four boat lengths on Cal. At the windward mark, a starboard-tack Stanford narrowly crossed Cal, and even though they had to tack twice to make the weather mark, they rounded ahead, executed a quick jibe set, and never looked back. Meanwhile, on the RC deck at the club, the crowd went wild. Both school’s marching bands played fight songs while the mascots wove in and out of the crowds. 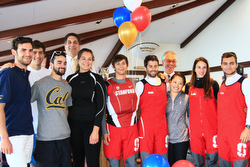 The dining room and the audience were decked out in red & white for Stanford or blue & gold for Cal; nearly everyone was an alumni or family of one of the Bay Area rival schools. Marching bands, cheerleaders, mascots and- - - sailboat racing? It was even more fun than it sounds. The regatta has spent a decade perfecting the schedule: first gun sounded at noon and last race finished no later than 1350 hours so competitors could accept their awards in front of a live and enthused audience. It was easy to watch—short courses immediately in front of the Club so that, as Young said, “even the oldest grandmother in the room doesn’t have to turn more than 60 degrees side-to-side to see all the action.” It was also easy to follow, as the live commentary rang out from both levels of the Club—sailors on the water could hear just as well as spectators in the clubhouse. Rivalry was a big draw. Yacht designer Alan Andrews (’77) flew in to race for Stanford. Cal performed the perfect collegiate caper by covertly delivering a 500-pound (immovable without a folk-lift) wooden statue of “Oski the Bear” to the Yacht Club’s lobby on the eve of the Big Sail. Stanford, the gauntlet has been thrown for next year! Multi-generational loyalty also fueled the excitement. With sailors ranging from college freshmen to the class of ‘67, the event appealed to generations of friends, fans, and fraternity brothers. Many of the young alums remember racing against each other as Varsity sailors. “The older folks get to remember their college days and the younger kids realize you can sail your whole life,” said Young. In the end, Stanford won by a hair, but everyone celebrated. Next year, Young plans to add a fifth division— a Women’s Division— to get more female sailors out on the race course. J/70 Norway + GRUNDIG Sailing Cup! 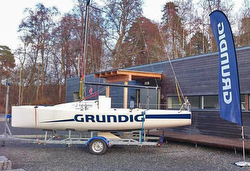 (Oslo, Norway)- Kongelig Norsk Seilforening (KNS- the Royal Norwegian YC) recently announced a new sponsor for their J/70 Class initiative- GRUNDIG- one of Europe’s leading hifi and electronics companies. 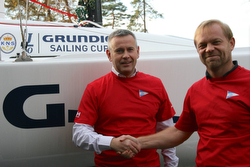 “The basic values and the important initiative made by the Royal Norwegian YC is very helpful to revitalize the sport of sailing in Scandinavia, coinciding with Grundig brand philosophy and our position in the market,” says Bård Nordhagen, Nordic Marketing Manager at Grundig Nordic. 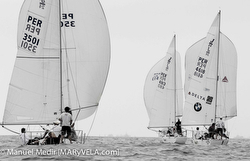 (Chorillos, Peru)- Leading up to the Peruvian J/24 Nationals are a series of regattas off Peru’s Pacific coast. The most recent was the Copa LEXUS held off Chorrillos in the second weekend of November. An excellent turnout was anticipated and the fleet of eight boats was quite competitive. (Naarden, Netherlands)- During the first weekend in November, the J/80 fleet in the Netherlands held their Frostbite Cup off Naarden, hosted by the Rowing & Sailing Club of Naarden. For the first time in years, a near record fleet of thirteen J/80's appeared on the starting line. After three races in 8-12 kt winds, Bernard Holsboer’s team on JUUL won with a 3-2-2 record. 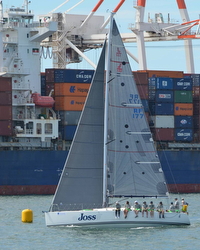 (Fremantle, Australia)- Double-handed racing in Western Australia continues to grow in popularity. This past weekend, a large fleet of double-handers took off the starting line at Fremantle for the 48nm Coventry Reef Race. 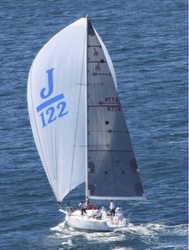 Participating in the event was the J/122 LITHIUM sailed by the father and son team of Graeme and Sam Monkhouse. LITHIUM has a double-handed IRC rating of 1.050 based on only one jib (J4) and one spinnaker (A5 on a top down furler). 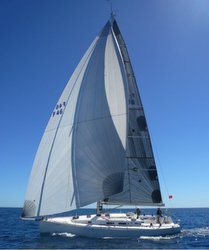 The go-to sail in light air is the Code Zero which can be carried to about 65 degrees true wind angle. LITHIUM was first to the day buoy and hoisted the A5 for the 6 mile reach out to the Western South Passage Lead marker. The breeze started to lighten and clock left. With one mile to go LITHIUM was forced to furl the A5 and unfurl the J4. A frustrating 30 minutes followed with the breeze around 4 knots on the nose and a never ending stream of power boats crossing to Rottnest Island. The ensuring wash made it very difficult to keep the sails filled. After rounding the western point in the lead, the Code Zero was hoisted and the speed increased to a respectable 6 knots in 8 knots of wind. The next leg was 19 mile due south to Coventry Reef– a semi-submerged rock approximately 3 miles offshore. With the wind continuing to clock left LITHIUM held onto the Code Zero up to Garden Island. With the wind now at about 220 degrees and dropping LITHIUM was forced to furl the Zero and try to get some speed from the J4. With more pressure offshore LITHIUM tacked out and sailed the remaining 10 miles down to Coventry. Great clumps of seaweed were a continuing obstacle for all yachts and I am sure the hockey stick keel on the JBoats was a significant advantage over a T-bulb of some of her competitors. After rounding Coventry, the A5 was unfurled and LITHIUM ran 12 miles downwind to a shortened finish off the southern end of Garden Island. The wind had now backed to 170 degrees and a final gybe saw LITHIUM cross the finish line 7 hours and 54 minutes after starting. As a result, LITHIUM won on IRC by 64 minutes over the second placed yacht. Congrats to the Monkhouse’s on their stunning performance! RAISIN’ CANE In The SORC Nassau Cup! (Fort Lauderdale, FL)- This year’s SORC Nassau Cup Race had all the makings of a “fast drifter”, with the forecast calling for winds in the lighter end of the spectrum at the start and providing just moderate gradient flow for the crews as they cross the ubiquitous, cobalt blue Gulf Stream, then bending around the island chain back down into the Nassau finish line off their signature candy-cane striped lighthouse at the end of the point at the harbor entrance. After a very slow Gulf Stream crossing, the fleet made its way between Great Isaac Cay and Great Stirrup Cay with the J/125 RAISIN’ CANE, sailed by Frank Atkinson and crew from Coconut Grove Sailing Club and West Palm Beach, FL sailing neck and neck with a Carkeek 40 called Decision. By Saturday late morning, Decision and RAISIN’ CANE had rounded the corner at Great Stirrup and was making nice progress toward the finish in Nassau, currently along the coast of Little Harbour Cay, home to the famous Flo's Conch Bar and Chester's famous Rum Punch— which must be as tempting as sirens' song to the sailors as they slide past in the light afternoon breeze. 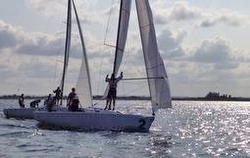 Ultimately, the PHRF Division was won by the J/125 RAISIN’ CANE helmed by Frank Atkinson. Taking third overall was the famous J/120 CARINTHIA skippered by Frank Kern from Bayview YC in Detroit, MI. Along the way, the beautiful (but light) sailing conditions enabled Frank himself to catch on video a school of dolphins playing in front of their bow during the race. Watch some of that sweet playfulness here on YouTube. The Palm Beach Sailing Beat! Fresh & Frosty Seattle Round County Race! Pellissier Crowned French J/80 Champion! J/160 AVATAR Cruising to Caribbean! Transat Jacques Vabre Race (TJVR) J/80 Training! San Diego Recaptures Lipton Cup! KAOTIC J/24 New South Wales State Champs!